After researching the Internet for 5 hours, going to 18 different websites, we think we have found the best deal for iFly tickets ($95 instead of $119). Klook is a reputable travel booking platform that offers hefty discounts on tickets. It is a franchise of SkyVenture which operates more than 32 wind tunnels around the world. Every single day, they bring joy to thousands of people by allowing them to experience skydiving at their convenience. They are the market leader in bringing skydiving to the masses. 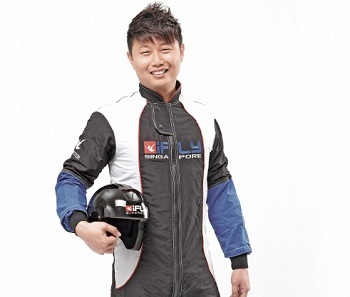 Lawrence Koh is the founder of iFly Singapore. He was a military paratrooper and was part of the Red Lions who impress crowds every year at the National Day Parades. Amazingly, Lawrence has clocked more than 1000 jumps over his distinguished military career. He is also part of a group of skydivers who holds the Singapore record for a 12500 feet dive over the city centre of Singapore. He has lived through the incredible experiences of skydiving and started iFly to allow more people to experience it. The whole process at iFly Singapore resembles that of being in an airport. Once you enter the building, you will feel like you are waiting to catch a flight. Only this time, you are both the plane and the passenger. Imagine the sleek and renown Changi Airport, and that’s pretty much what the entire iFly experience encases. When you register, you are greeted by a counter that is reminiscent of an airport check-in counter. 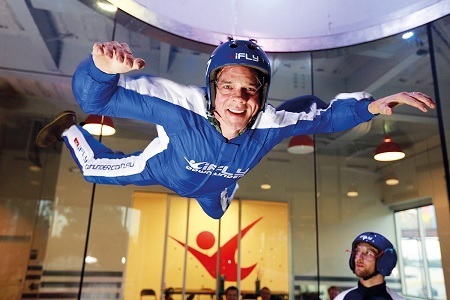 The entire experience of iFly is estimated to last a total of two hours. You are required to be present for about an hour before the time of your flight booking. Don’t be late as iFly follows a pretty strict schedule. They may charge you an extra fee if you need to reschedule your flight. There will be a safety briefing to ensure you are well-prepared to enjoy the bliss of flying. Gears such as the flight suit, helmet and goggles are provided at no additional cost. You will be required to sign an indemnity form before you are officially allowed to join the program. 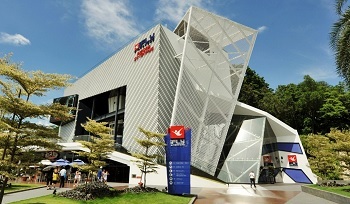 The focus on safety stands out at iFly Singapore. They have a long track record of safety both in Singapore and all over the world. Their patented technology allows you to enjoy a heart-racing activity with minimal risks. iFly’s training and safety system are also certified by the International Bodyfight Association (IBA). It is indeed up to world-class standards. With such stringent regulations, skydiving at iFly Singapore is as safe as it can be. Step into the next room, and that is where the real training begins. There is a big screen that will play instructional and training videos. Pay close attention as there is important information that is required for you to enjoy the experience thoroughly. One crucial thing that you must learn is the hand signals. While you are skydiving, it is almost impossible to communicate normally. Therefore, the only form of communication is through these hand signals. After the videos, a friendly instructor will come in to guide you on how best to achieve the right flying posture. There are two comfortable benches where you can lie down to practice your skydiving stance. The instructor will be there to offer you advice and feedback constantly. After this, you are all set for one of the most thrilling experiences of your life. When you first set your eyes on the 17 metres tall wind capsule, you will be blown away by its humungous size. The wind tunnel is made of acrylic glass that allows you to set your eyes upon the beautiful Siloso beach during your skydiving adventure. With excellent views of the deep blue ocean, while you soar in the air, it is indeed an all-encompassing experience. If your flight is at night, you could even catch the light show from the Sentosa Wings of Time performance. No matter day or night, it is always an incredible physical and visual treat. Inside, wind speeds of up to 170km per hour carry you off your feet into the magical feeling of flying without wings. For a first-timer, you may not feel fully in control of the situation. Inside the wind tunnel, even the smallest movements can result in a big reaction. However, there’s no reason to worry. Your friendly instructor will be right by your side at all times. He or she will constantly give you advice, adjust your posture or even fly with you. First and foremost, the incredible feeling of floating in mid-air is indescribable. It is truly a memory of a lifetime. To remember the experience, iFly has created physical mementos that you can keep. After you completed your flights, a certificate of achievement will be presented to you. Want to remember the flying experience? You can purchase a professionally taken photo from your skydiving journey. That picture will look good on your office desk. A conversation starter for sure. 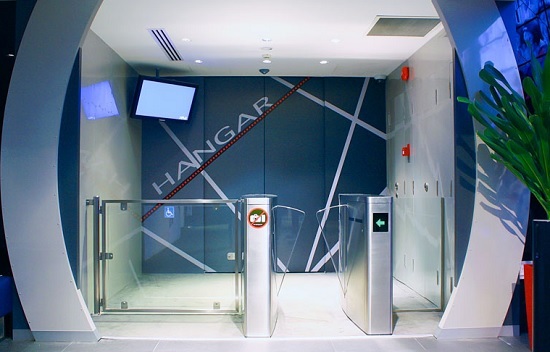 iFly Singapore Price – How Much Does it Cost? 2) The Challenge package which includes a total of 2 skydives which costs $119. We will recommend the Challenge package as one skydive is less than 2 minutes. Also for the first timer, the second skydive will be more enjoyable as you will be more experienced. If you can’t get enough of the thrill of skydiving, iFly Singapore has a whole array of packages that will fuel your adrenaline needs. iFly is open every single day of the week. For all days except Wednesday, it is open from 9am to 9.30pm. Its first flight starts at 10am and last flight starts at 9.30pm. For Wednesday, it opens only at 11am and closes at 9.30pm. The first flight takes place at 12pm, and the last one is clocked at 9.30pm. You can find it at 43 Siloso Beach Walk #01-01, Singapore 099010. If you are driving in, you can park your car at the basement car park of the Beach Station. There are more than 600 available parking spaces. You will be able to find an empty lot most of the times. For public transport, you can take the tram, Sentosa buses or even taxis. Simply stop at the Beach station at Siloso beach. 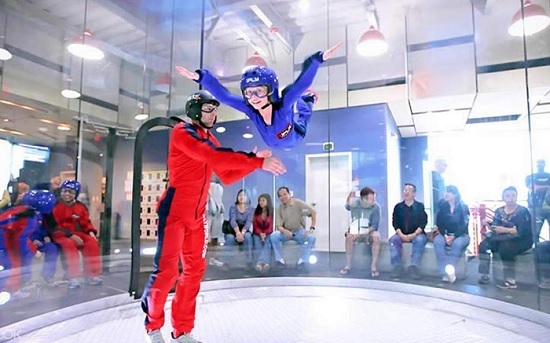 After that, iFly Singapore is just a short 1-minute walk away! Comfort is the name of the game. Avoid ill-fitting or overly tight clothing. Shirts with collars are also not recommended as it will move around intensely during your flight due to high wind pressures. We would recommend a simple T-shirt as your attire of choice. Regarding footwear, you are required to wear shoes. Again, comfort is important. A good pair of sports shoes or your favourite pair of sneakers will do the trick. Not to worry if you can’t get a hold of a pair of shoes, you can rent a pair for just a few dollars. Accessories such as jewellery and watches need to be taken off before your flight. While there are lockers available for you to use, we would recommend that you keep your precious diamond necklace at home! For participants with long hair, do tie it up unless you appreciate the bird nest hair look after your flight. Is the iFly Experience for Me? If you love thrills, the iFly experience is definitely one for you. There are just some rules and prerequisites that you should follow. Firstly, you should be 7 years old and above. There are also some weight limits for safety reasons. If your height is not more than 180cm, the maximum weight recommended is 120kg and below. If you are taller than 180cm, the weight threshold is 140kg. However, you can drop them a message or call to inquire further. They may be able to make exceptions on a case to case basis. Pregnant ladies are not allowed on the iFly because it is a high-intensity activity that does carry risks. If you have had an old injury on your back, neck or shoulder, this activity is not for you as it could aggravate those old injuries. You must not be inebriated or under the influence of drugs. Impaired judgement, reflexes and movements are dangerous for such a high-intensity activity. Also, please bring along an identification card with a photo attached. For the tourists, bringing your passport is recommended if possible. That is all you need to enjoy the wondrous feeling of flight. Go on and be free at iFly Singapore! Best Places to Buy Chia Seeds in Singapore – Prices, Recipes and Benefits! The Ultimate Guide to the Sentosa Fun Pass Plus How To Get It Cheap!